A View From The Hook: A Ceremony Honoring Historic Dutch Vessels in the Atlantic Basin - Red Hook, Brooklyn. A Ceremony Honoring Historic Dutch Vessels in the Atlantic Basin - Red Hook, Brooklyn. I just received the news of this event at the Atlantic Basin, September 13th, 5 - 7pm, via Councilwoman Sara M. González and the New York City Economic Development Corporation (EDC). This event is being held in collaboration with PortSide New York, who, along with their ship the Mary Whalen and their accompanying cultural activities and community programs, have been named as future occupants of a small portion of the Atlantic Basin and Pier 11 on the Red Hook waterfront. This is a part of the EDC's recent plans for that location (which in great part is based around the relocation of Phoenix Beverages from Long Island City and the expansion of the operations of the Container Terminal). This cool event is open to the public and should be not only an opportunity to have a look at these interesting boats and have a locally supplied snack with the boats' crews and attending dignitaries, but also an opportunity to take a rare glimpse of the hidden jewel of a historic harbor that lies within our neighborhood but is, along with the Cruise Terminal, secreted away and mostly inaccessible behind razor wire. The Atlantic Basin. 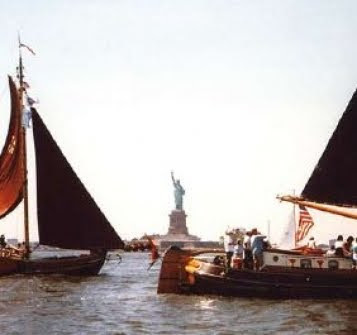 As part of the NY400 Celebration commemorating the Quadra-centennial of Henry Hudson’s voyage into New York Harbor, the Dutch government is sponsoring a visit by a flotilla of 20 historic Dutch “flat bottom” boats. These traditional Dutch sailing vessels are similar to the sloops that cruised New York’s waters throughout the 19th and early 20th centuries. 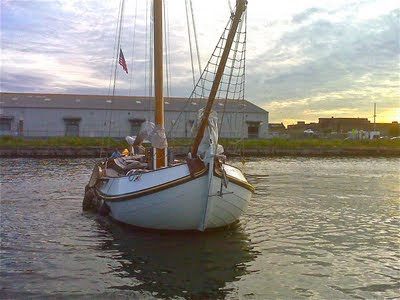 The flat bottom boats will homeport while in New York at Atlantic Basin in Red Hook, Brooklyn. Many of the crew members -- about 120 or so -- will live on board the boats during a two week period providing them an opportunity to interact with local residents and enjoy local restaurants, stores, and sites. 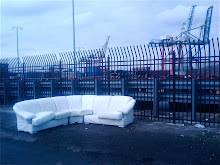 Location: Atlantic Basin, Brooklyn Cruise Terminal, south side of Pier 11 (see map). The flat bottoms will return to Atlantic Basin after a day in the Harbor. The public will be able to watch these historic boats enter Atlantic Basin and tie-up and hoist their ceremonial colors. Crew members will disembark the boat and be greeted by NYCEDC President Seth Pinsky and invited guests, including Councilmember Sara Gonzalez , Rep. Nydia Velazquez, Borough President Marty Markowitz, along with other community leaders and groups. After welcoming remarks the public will be invited to mingle with the crew and enjoy a light repast from local Red Hook eateries. More information about the boats can be found at www.spts.nl. UPDATE: The boats will be on their way to Long Island Sound tomorrow (Friday) but will be back in the Atlantic Basin again from September 8th. Andrew Genn from the EDC (who also supplied the photo, below) has said that you can wander down and take a look, have a chat, etc. by entering the area via a gate at the bottom of Pioneer Street or via Bowne Street (I believe) after that date, as is also the case on the 13th - the day of the event. This interesting event was suggested by Carolina Salguero, PortSide New York's founder and director. Thanks Carolina. 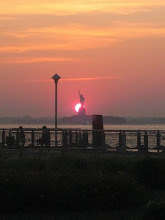 UPDATE 2 - Extra info from Carolina Salguero at PortSide: PortSide NewYork is producing a special Visitor Guide to Red Hook and the Flat Bottom Fleet. www.portsidenewyork.org/PortSideRedHook+FlatBottomFleetGuide.pdf will go live on Wed 9/9 (there will be a placeholder document there momentarily). The project is a collaboration between PortSide NewYork and Will Van Dorp a blogger who specializes in the waterfront with two noted blogsTugster and Henry's Obsession http://tugster.wordpress.com and http://henrysobsession.wordpress.com/. PortSide is creating a guide to Red Hook retail and services and a short history of the neighborhood along a waterfront theme; and Will Van Dorp will contribute the guide to the Flat Bottoms and some history of the Dutch in Red Hook.